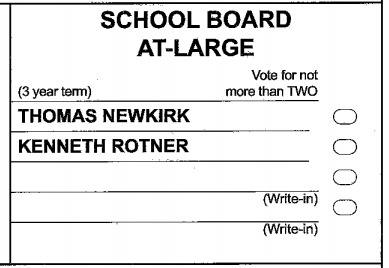 Congratulations to reelected school board Chair Tom Newkirk and reelected school board member Kenny Rotner. Percent YES 2015: 60.8%, 2016: 69%, 2017: 85%, 2018: 74%, 2019: 67.5%. Congratulations to the district and the board. ORESPA, secretaries and custodians, got their annual 2.5% raise for the next three years by a vote of 76.4% to 23.6%. That's a noticeably better margin than for the budget. In Lee, everyone was elected and everything passed except the Town Center, which got 336 YES (43%) and 442 NO (57%), far from the 60% needed for passage. The citizen anti-nuclear weapon petition passed 481 YES (65%) to 258 NO (35%). Fund 10 = $45,940,460 (regular operating budget); Fund 21 = $824,050 (expenditures from food service revenues); Fund 22 = $600,000 (expenditures from federal/special revenues); Fund 23 = $41,000 (expenditures from pass through funds). Total ORCSD votes cast today: 1600. There's some news, which I'll list so I remember to write about it soon: Superintendent planning to retire, Graduation Day June 7, 2019, Niche.com rates Oyster River highly, Deliberative Session report, Congratulations Jay Richard NH Middle School Principal of the Year, New Middle School Sales Tour Begins. Election Day is tomorrow as I write this so that's what I'll focus on. In addition to the ORCSD ballot, your town is having municipal elections; click for sample ballots (Durham, Lee, Madbury). This is my annual guide to the March 12, 2019 Oyster River School District election. The ORCSD ballot is relatively noncontroversial this year. I'll be voting for all the listed candidates and YES on the questions. Hopefully unlike the last two years there will be no weather incidents that disrupt the voting. If you're a US citizen over 18 who lives in Lee, Madbury or Durham, you can just show up on Tuesday at your town's polling place and vote. Like almost all elections in New Hampshire, same day registration is available. So even if you've never voted or registered to vote in New Hampshire before, you can vote Tuesday. It's easier if everyone brings a state photo ID and if new registrants also bring proof of address (a utility bill), but under New Hampshire's voter ID law you can vote even if you don't bring those by signing a form at the polls. Durham: Oyster River High School 7:00 a.m. – 7:00 p.m.
Lee: Public Safety Complex 7:00 a.m. – 7:00 p.m.
Madbury: Town Hall 11:00 a.m. – 7:30 p.m.
As always, voters in each town are given identical school district ballots. Let's briefly go through the ballot questions, also known as the warrant articles. For more information, please see my last post and the recently released SAU 5 Annual Report 2019. Article 1 elects the moderator. It's always Richard Laughton. Article 2 elects the school board members. This year we have two candidates for the two at-large seats, so they're both going to win. They are existing board chair Tom Newkirk and board member Dr. Kenny Rotner, so no changes there. Tom has served on the board since 2012 and Kenny since 2013. I don't think the teachers' guild even bothered with their usual questionnaire this year. I saw that Tom put out his signs but I didn't see any Kenny signs. I can't decide who's the wise one on this. I went to Candidates' Night a few weeks ago. Besides the district clerk Bill Leslie and the candidates, four members of the public showed up. Thanks to the Mast Way PTO for refreshments as always. No one recorded the meeting, which I think led to a more frank discussion. We covered the new middle school and its financial impact as well as the district's mental health programs, among many topics. Congratulations Tom and Kenny. You're sentenced to three more years of hard labor. Article 3 asks the voters if the district can spend $47.4 million! That's a lot of dollars. It doesn't say here, but after the state money and other revenue is accounted for, the amount asked of the taxpayers of the cooperative went from $40.2M to $41.6M, an increase of 3.5%. Because Lee's property values went up 10% (as estimated by the state) in 2017, compared to 5% for the other towns, the cooperative's apportionment formula shifted more of the bill to Lee. It will likely even out next year, but this year Lee's Local School Tax line is estimated to increase 10%, compared to 3.5% for Durham and a decrease for Madbury. I don't think we in Lee should be mad at the school district for this increase, but I'm pretty sure much of the rest of the populace doesn't share my view. Should the default budget be enacted through a NO vote on this article, the $550K saved will lower the Local School Tax about 1.5% but Lee will still get a big increase. The budget includes $800K to develop plans for the new Middle School, 2 points of the 3.5 point increase. I thought this was a shockingly large amount given that the voters don't get to weigh in until next March. Article 4 asks the voters to approve the contract with ORESPA, the Oyster River Educational Support Personnel Association. ORESPA is the collective bargaining unit for the Secretaries and Custodians. The contract is for a 2.5% annual raise, slightly above the recent inflation rate. That's it for the ballot. See everybody at the polls tomorrow. Lee school tax up 10%, middle school cost doubles, Happy Indigenous Peoples' Day! It's been forever since I've posted. There is plenty of Oyster River School District news. The Lee school tax news turned into an apportionment essay, so I put that last. The main culprit turned out to be the 10% change in Lee's Equalization Ratio; which is the number the state calculates every year that estimates the ratio of assessed value to market value. Lee is hot, taxes go up. There was an ingenious plan to build the new middle school with virtually no tax impact. There is currently a $25 million dollar bond on the high school renovation we're almost done paying off. The plan was to start financing the new middle school for that same amount and presumably a similar interest rate when the old bond ended, resulting in no particularly noticeable change in your taxes. Unfortunately that plan collided with reality when estimates for a new middle school came in around $50M. The board adopted the middle school committee's report to build a new school, either on the current location or the Goss property, northeast of where Main Street intersects Route 4. It's down Technology Drive where the UNH Interoperability Lab used to be. The Goss property was always a red herring; it wasn't actually for sale and would need major infrastructure and permitting work to make new roads etc. that would have added years and millions. Plus it's a bad location, away from the high school, UNH and downtown. The Interoperability Lab has moved to Madbury Rd, a stone's throw from the middle school. The board decided to build a new building on the current location, with only member Michael Williams voting NO. Williams liked the expansion possibilities at the new space. Michael is emerging as the rebel on the board, the sole NO vote on a few interesting things. The current number they're throwing around for the new middle school is $46 million. Let's say that the taxes go up because we have to finance $21M of that beyond the $25M we're already carrying for the high school. Back of the envelope, a 20 year amortized loan of $21M at 3% takes annual payments of say $1.3M. At our current $45M budget that's a 3% increase; not that bad. Assuming there are no outside funds offsetting it, the tax impact will be about 9/7 of that, so maybe a 4% increase on the School Tax line. Depending on your town and the year, the school tax is between half and two thirds of your total tax, so the increase nets out to 2% to 3% on your total bill. That's compared to a slightly bigger reduction in your tax bill if the high school bond is paid off with no new project. The plan is to build the new building on the current footprint, while students still attend school at the old building. When the kids are in the new building, the old one comes down to make room for fields again. There is the possibility that Durham might want part of the old building as a community center; no decisions there yet. Finances aside, it's an exciting project. I'm only sorry my youngest is currently in eighth grade and so my kids won't get to attend the new school. Grandkids maybe. The board changed Columbus Day to Indigenous Peoples' Day in time for last Columbus Day, pardon Indigenous Peoples' Day. This follows Durham, which changed it a year ago. It took two meetings; both times local and regional Native Americans spoke at the board meeting. They were dissing old Chris pretty good: he wasn't the first to discover America, there were already people here, he personally ordered tortures, enslavements and mutilations, and the whole smallpox blankets and subsequent few hundred years of genocide were bad. On August 29th, 2018 the board approved Indigenous Peoples' Day. Member Cisneros was the sole NO vote. Most school documents seem to now refer to the day as the Columbus Day/Indigenous Peoples' Day Holiday. Columbus Day remains a New Hampshire and national holiday, as well as a holiday in Lee and Madbury. A few years ago, the voters approved the sale of district property, 25 acres on Orchard Drive. The original idea was to help finance the new field; the hope was to get a few hundred thousand dollars. The property went out to bid and I think the best bid was $150,000. Some residents and the Town of Durham floated the idea of purchasing the property and developing a recreational area. Durham's plan involves fundraising, and the school district agreed to sell the land for $150,000 to Durham if the funds are raised. Both Durham and the school district have committees attending to this issue. I zone out whenever this comes up so I'm a little hazy on whether the district is severing the buildable 8 acres from the 17 acres of wetlands. On November 29, 2018 the district held a Mental Health Forum in the ORHS cafeteria (video). It was modeled on the diversity forum held a year before. The Student Mental Health and Wellness Committee ran the event; their supervisors are Counseling Office Director Heather Machanoff and school psychologist Dr. Ryan Long. It is part of a district-wide effort to focus on student mental health, generally under the banner of Social and Emotional Learning. I can't find my notes, but I recall around 150 community members attended. Though I don't think the district says this, I would venture that the precipitating event was the very public suicide of a student last April. There were three sets of presenters: Professor Erin Sharp on adolescent neurobiology, Grace Smith and her mother on mental health challenges in their family, and Michele Watson & Laurie Foster from NAMI, the National Alliance on Mental Illness. After each speaker the audience was given discussion questions which each table considered for a few minutes and reported out. A wide variety of community service groups set up tables; I got an Ally button from an LGBTQ group based in Portsmouth and a Strafford Country Public Health Network water bottle among other swag. I haven't been as lonely as usual at some recent board meetings because community members have been coming to advocate for World Languages to be taught all grade levels. Currently the elementary schools and early middle school grades have no foreign language instruction. The board seems willing, at least for middle school, the main concern being finding the time in the schedule. They've added a sixth grade world language goal to their board goals this year, to be discussed at the May 9, 2019 meeting. Mark your calendars. The Deliberative Session is February 5th, 7pm, ORHS. It's a real election where a majority of the typically 50 to 120 voters who show up can amend the March ballot questions. There may be some irate folks from Lee upset about the tax increase. Unfortunately, I'll be at sea and won't be able to attend. Member Howland is tasked with explaining the budget including the Lee millage; I'll be tuned in. Here's the warrant that will be presented at Deliberative Session and eventually go to the voters in March. Really the only possible amendment to make at DS is to lower the $47.4M (!) budget by some amount; usually no one makes that motion so likely the warrant questions will appear on the March ballot unchanged. The ORYA saga continues. The original concern surrounded a coach declaring to other coaches that he'd get a pitcher to bean the sole girl in the league if she was on his team. This made national news and Major League Baseball, which apparently has some supervisory role over little league, got involved. Fosters reports Durham will only provide $28,000 to ORYA this year, and that only after an audit. That's down from $41,000 last year. I checked Lee's current budget; Lee is fully funding ORYA at an amount larger than Durham even though Durham has around 40% more children. I couldn't help but notice the next line where the Board of Selectman cut $7,150 out of the Lee Rec budget despite the recommendation of the Advisory Budget Committee to fully fund. I went to a couple of Lee Rec events last year with my kids which were really great, especially model rocket day. Much care was taken to keeping everyone safe. To my knowledge none of adult supervisors plotted to injure any of their charges. There are rumors of lawsuits and retaliation so I will endeavor to make only factual claims. 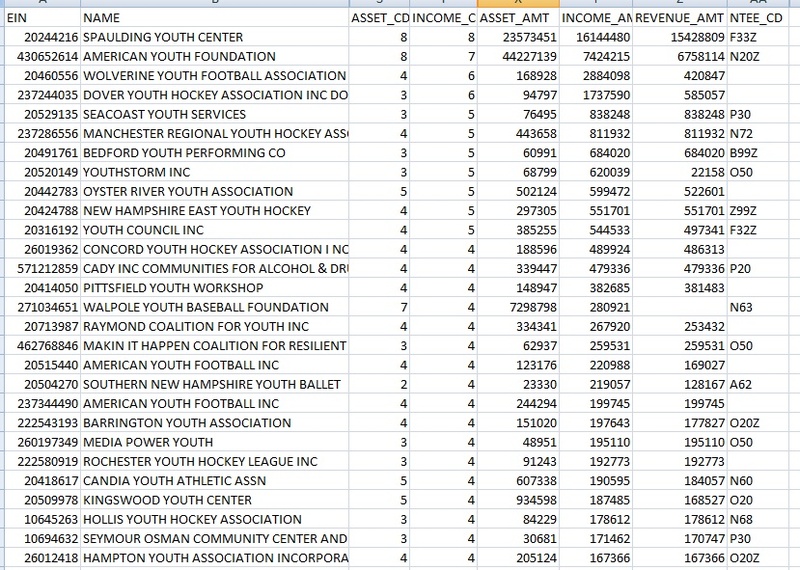 When I looked for comparable youth associations, I found most in New Hampshire are smaller than ORYA, many small enough (under $50,000 revenue) to file the postcard tax return. Lots of towns get by with their own Recreation departments doing the heavy lifting. ORYA has the largest municipal grant by far. ORYA grants are 18% of revenue, compared to 2% to 13% for the other YAs. ORYA has the largest salary expense by a large amount. Most YAs get by with no salary expense at all. Dover Hockey salaries are split among a dozen employees; OYRA reports seven but they left blank the form where the key employees are named. The 2013 return shows two program directors making $52K and $56K respectively, about a $7K raise each from the previous year. ORYA has a huge accounting expense. Concord and Dover hockey have similar sized programs but get by with $2400 and $8600 accounting expense respectively. 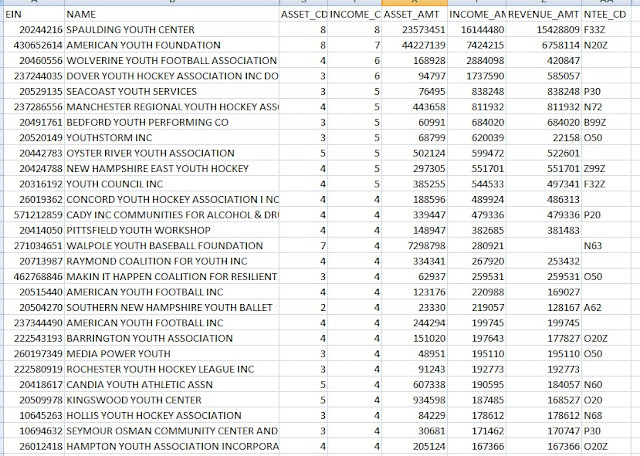 Here's Manchester Regional Youth Hockey, $2000 accounting expense on $812K of revenue. ORYA's accounting firm is in Durham and the preparer is also the treasurer of ORYA, so this is pretty similar to a wage paid to an officer. I presume that doesn't need to be reported in part VII of the return where $0 is reported paid to the treasurer. On the other hand one point of the return seems to be the disclosure of conflicts, so I'd need to ask an accounting professional. ORYA has outsized cash and non-cash assets. They list as an asset $358K of leasehold improvements (less $155K depreciation) which means improvements to a space they don't own. I'm not sure what all that is about but these are huge numbers so I'd like to know more. I didn't notice more than a few thousand dollars of leasehold improvements on any of the other returns. ORYA doesn't seem to have much in assets like athletic equipment as far as I can tell from the return. In summary, ORYA has substantial cash and non-cash assets. It has outsized salary and accounting expenses which exceed the large grant they get every year. It appears a few people in Oyster River are getting paid a total of $128K or so whereas most other youth associations around us rely on volunteers. My preference as a taxpayer is for none of the towns of Oyster River to grant ORYA money. They seem well on their way to being a viable business without direct taxpayer support; let's help them take that final step. We'll still let them use the fields. From this little mini-audit we did I can understand why Durham wants a professional audit. The finances of ORYA look a bit different than that of other youth associations. I look forward to the audit report. The district met its budget goal of a tax impact (change in budget less revenue) of 3.5%, impressive in this difficult budget year. Below is the table of major drivers. The big ticket items include $800K toward preliminary work on the new middle school. The school can't go ahead without voter approval; this money gets the project to the point where it can be presented to the voters. $755K goes to yet another construction project, fortifying and expanding Moharimet's entrance. The federal matching funds are available, so it's now or never, and the board chose now. Mast Way's construction, including a new entrance and four new classrooms, is reportedly complete, though I think the construction fence still lingers. The budget hearing for school year 19/20 was Monday, January 8. Superintendent Morse broke the news that the millage will be increasing $0.52 in Durham, $1.91 in Lee and actually going down $0.20 in Madbury. 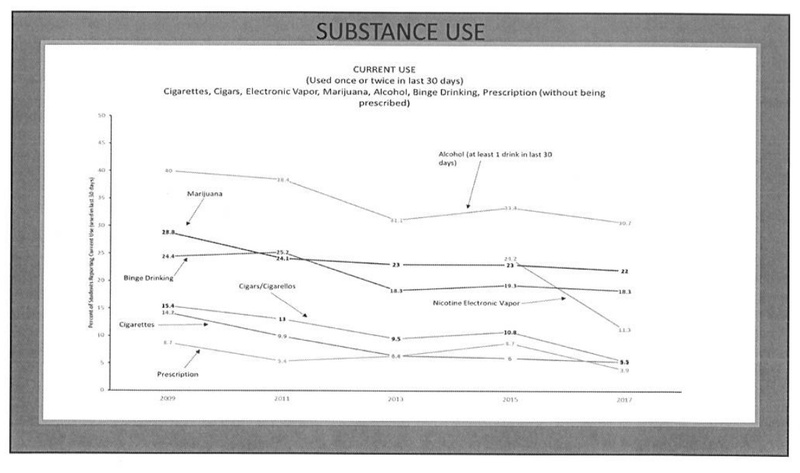 On the slide it appears the more we spend the more Madbury's millage goes down; I have to meditate on that one. I'm overdue for another extensive post on apportionment in the cooperative so I guess this is it. We're all familiar with getting a tax bill twice a year; exactly how that Amount Due line gets calculated is a bit involved. At its simplest, it's the product of two other numbers on the bill, your total tax rate, also known as the millage, tax per thousand dollars, and your property's net value, also called the assessed value. The total tax due is divided into two payments, due July and December. Actually the calculation for this year's tax isn't done until the December bill; the July bill is always half last year's total tax. The total tax rate is the sum of four millages: County, School, Town and State Ed. The school district isn't involved with the Town and County lines. The State Education tax goes to the state, which metes it back to the towns according to their need. The district has no say in that particular millage but the so-called adequacy aid each town gets from the state goes to lower the town's School millage. So in context we see the School (Local Ed) millage increase are .52/14.93 = 3.5% for Durham, 10% for Lee, and -1% for Madbury. As I write this I don't know why Lee's estimate is so large. Keep reading and we'll try to find out together. After the superintendent reported it he didn't try to justify it, he backpedaled. He gave a lecture about how poor the predictions have been over time. He presented a slide with the sum of the state ed and local ed over the years, confusingly called that the increase each year, and showed how the predictions were often off. This was odd for several reasons. We don't actually predict that total, we predict the change in the State Ed line. And it misses the point that the intent is not really to predict the change in millage; the intent is to give us all a number which we can each multiply by our assessment to estimate the change in our taxes. It's that estimate in dollars which we want to know is accurate or not. The predictions are assuming assessments are constants, the same as last year. So the millages are really proxies for the change in the amount of school tax. If the town's valuation goes up (it's tied to the real estate market) it's liable for more school tax even though its millage would go down. The positive estimate more accurately reflects the change in the tax you'll have to pay which makes it a more useful indicator than a correct prediction in the millage without a corresponding prediction in valuation. What I mean is Lee's millage could actually go down but we still might be paying 10% more tax like our predicted millage told us. The superintendent is right that some alarming predictions we've seen have regressed in actuality, appearing smaller than predicted. But presumably a big predicted change in general means a big actual change, otherwise why would be bother to make predictions? Let's talk about how we pay for schools. We're only talking about the School (Local Ed) tax. The top line for us today is the amount to apportion, let's call it B for budget. Each fall the district prepares a budget which the voters approve in March. The budget has a total amount of expenses E and some non-state revenue R. E is all the spending, including operations and debt service. R is the expected revenue, including grants from the federal government, income from renting facilities, last year's fund balance (unspent money), and tuition income. The amount to apportion is B = E - R. Simple. Here's how B is apportioned, split among the towns. Half of B is split proportional to the student population from each town. There's a measure called ADM, Average Daily Membership. For each student in public school it's the fraction of the year they're enrolled, so 1 for a student enrolled all year. It's added up for each town and the result is the ADM for each town, the number of students from each town. There are rules to count students which the district pays tuition to send elsewhere and other unusual situations. The other half of B is split proportional to the equalized assessed property values for each town. Then each town receives adequacy aid computed as $3700 per student, with around $2000 extra for each special education and free-and-reduced-lunch student and $700 for each ESL and poor third grade readers. Let's call the amount A; there's a different A for each town. Call the result of the apportionment f, the percent of B that a given town owes the school district. There's T=fB-A left to split among the property owners in town. That's done in proportion to the net assessed value of their property. Each lot has a certain value L including land and buildings; the sum of all of those is the total valuation of the town V. (UNH buildings and government buildings don't count.) The millage for the school tax line is T/V and your share in dollars is LT/V. This is a very complicated system that in the end works out to approximately a pizza with 9 slices; Durham buys 4, Lee 2, Madbury 1, and the state 2. The 4:2:1 is pretty close to the equalized property values of the three towns so pretty much works out to the same as if we were one big town. 4:2:1 is 57%:29%:14%; in current school year FY19 equalized valuations D:L:M is 59%:27%:13%, final local tax assessments 57%:28%:15%. There are some straightforward reasons why these numbers swing from town to town, so pretty often it seems like one town or another is bearing a disproportional burden. Most obviously, the number of students from each town varies as new students enroll in Kindergarten, old students graduate, some leave for prep school, and some move in or out of town. Half of the bill is split according to the average number of enrolled students from each town. The other half is split according to the equalized town valuations. So if more real estate is built in a town, its share of tax goes up. If real estate becomes tax exempt in a town, that town's share of the school tax decreases. 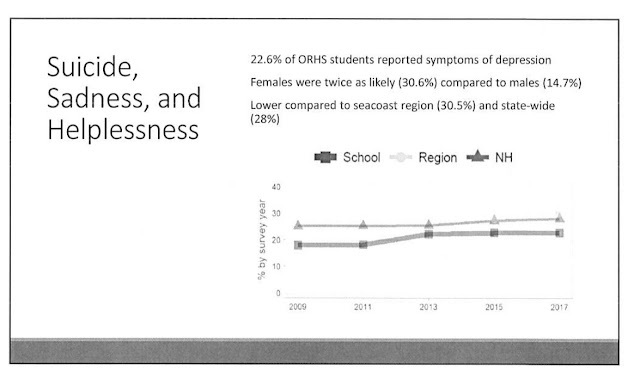 Assessments occur constantly, so these numbers fluctuate. Less straightforwardly, it's equalized valuation. Each year the state does a calculation that compares sale prices to assessments in each town and determines the factor for your town. That's the number which when multiplied by the market value of your house gives your assessment. Sometimes there aren't very many sales so there's some randomness in these numbers. The factor is called the Equalization Ratio. Assessed values tend to be lower than market values, so the equalization ratio is usually less than one. Equalization makes your tax bill a financial derivative where you're short your own town's real estate and long the other two towns. When home sale prices go up in your town more than the other two your tax bill goes up as well. If that's not complicated enough, there is the timing. Let's talk about the current school year, 18/19, known as FY19 in the budget. The district prepared the FY19 budget in fall 2017, presented it to the public in January and February 2018, and the voters approved it March 2018. The state calculates the apportionment and associated tax rates by the first half of October, 2018 in time to be reflected in the tax bills which are due December 1, 2018. That October 2018 report is calculated using the 16-17 school year attendance for each town; i.e the FY19 apportionment uses FY17 attendance data. It also uses the 2016 valuations and equalization ratios. So the data which goes into the calculation is two or three years old. That should make it easier to predict next year. OK, a lot of words and we still don't know why Lee's up 10%. It's probably because it's its turn. We see how as the numbers slosh around from year to year the burden appears to fall unequally on the towns, but it evens out over time. Lee's been lucky lately and its luck just ran out. Let's make a spreadsheet that tries to capture the calculation for the last few years and see if we can gather the data for the prediction. 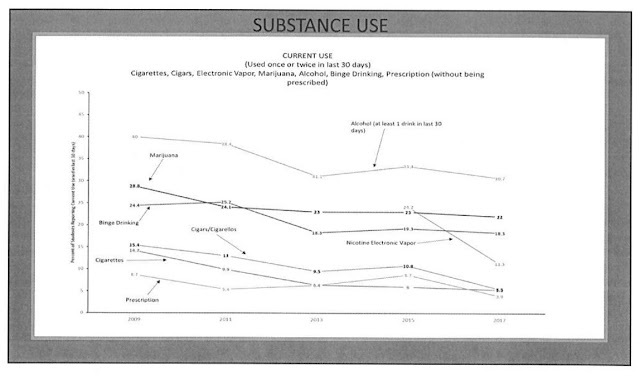 The data comes from NH DOE and NH DRA, 1 2 3 4 5 etc. It took me a while to get the calculations to match reality. I never got the computed equalization ratios to match the state values for the ratios, though they're close for Lee. Note how the apportionment percentages are calculated using two year old valuations and attendance to compute the tax each town owes the school, and the towns use the current valuations to apportion the tax among the residents. The Modified Raw Value including utilities is the basis of the school tax but it's not really used in the calculation except to check the ratio; instead I use the equalized valuation reported by the state. 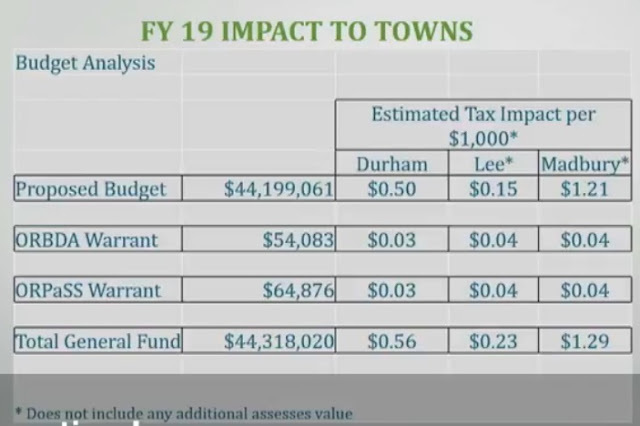 I didn't notice that 12% reduction in Durham's school tax millage this year (FY19) until now. It's a reflection of the 10% increase in Durham's 2018 raw assessment. For the FY20 prediction, I used the $47.45M top line off the warrant. I didn't find the predicted revenue in the budget so I fudged the FY20 revenue until I got about 3.5% impact. I made it a bit higher because of the Keno, which I left the same except for removing Durham's tree grant which looked like a one time thing. I used the enrollment data the superintendent showed at the budget hearing because I couldn't find a more official report. I left the current assessments unchanged and got the latest version of the equalized value which generally matches the one on the apportionment calculation. The result wasn't that close to the forecasts from the district. Lee's millage went up $1.82, not quite the $1.91 but pretty good. Durham is up $0.49, again not quite $0.52. Madbury is predicted up $0.52 as well; I didn't see the downward -$0.20 rate change as predicted by the district. The district may predict or get guidance on the state aid as well which they incorporate. The reasons for Lee's rise are apparent. The main driver is the equalized value that went from $473.69M to $530.86M, a whopping 12% increase, leading to a 6% rise in taxes. Actually the effect is not quite so big because Durham and Madbury saw increases as well, though less than half as big. The modified raw assessed value only changed from $446.75M to $451.76M, a 1% increase. So the change is almost entirely in the Equalization Ratio, which went from 94.3 to 85, a 10% change. In other words from a few sales in Lee in 2017 the state determined all real estate in Lee was worth 10% more than in 2016. That's why Lee's taxes are going up this year. Attendance-wise Lee's share of the students went from 33.94% to 34.64%, an increase of 2%, adding 1% to the tax (because it's half the apportionment formula). The remaining component of the increase is the increase of the budget itself, adding another 3%. We can try to predict the future beyond next year. The 2018 equalization ratios come out on May 1, 2019. Assuming no surprises, we might expect Durham to see a spike in their fraction of the FY21 apportionment as the 2018 spike in real estate gets incorporated into the apportionment formula. Until then the more raw real estate in Durham the more property to split the bill, so a lower millage. But a few years later the additional real estate is incorporated into the apportionment so the millage goes up again, but only half as much as it went down because equalized value is only half the bill. This is a long post I've been composing for a week or so now, so I think it's time to let it go out. I'll write more after the deliberative session. I haven't posted since the snowy election day. I have been going to the board meetings, so I thought a recap was in order. My deepest condolences go out to the families and friends of both students. Our cooperative football team with Portsmouth High got an expedited approval from the NHIAA. Initial reports indicate fourteen Oyster River students are interested in playing football at Portsmouth High School starting this fall. No one will be cut; all who wish to play may. The involvement of our district has been minimized. All practices and home games are in Portsmouth. Students are responsible for their own transportation and fees. Despite this distancing Athletic Director Lathrop seemed certain that individual financial barriers could be overcome through available private support in a way to enable near equal access to all students interested in playing. The report recommends two sites: the existing middle school site or the Goss Industries site. The latter is an industrial park just northeast of the Route 4 / Route 155A intersection. It used to hold the UNH Interoperability Laboratory, but that's been moved to Madbury Rd near the middle school. The main benefit of Goss is the sixty acre size including large parking lots. UNH is interested in a joint venture but no one's even attempted to inquire about purchasing the property, so this is a strawman. The existing middle school site is by far the most likely choice. My impression is most folks think despite the occasional drunken Cinco de Mayo, the central location of the middle school near the high school, downtown Durham, the library and UNH is preferable. The exact location for the new building is undetermined. The existing building would be left in place during construction. The board gave approval to engage an architect to continue the planning process. With luck and voter cooperation, the financing for the new middle school will begin right after the financing for the high school renovation ends, and they should be generally similar amounts, so hopefully no painful hike on our tax bills. Despite some effort the whole new middle school issue hasn't really registered with the public yet. The superintendent will probably stretch this part out to get the public engaged, nominally to make this practically already decided decision on the site. Construction is in full swing, adding new classrooms and a music room in the rear, and a new secure entryway in the front. The price tag was over $1M, with federal money paying for the entryway work and your local tax dollars the rest. Completion isn't expected until late October unfortunately. The district passed a new policy which bans student use of personal devices in grades K through 8. In tandem, the district accelerated plans to move to a one-to-one computer model, in which each middle school student is assigned their own device owned by the district. Due to a big effort by IT Director Oldstad and the entire IT Department, the program will be geared up and ready to roll out in the fall. Forty high school students will travel to China in April 2019, a trip similar to the nineteen students that went in 2017. The board approved that trip less than a month before the students left; this time we have a leisurely year to prepare. I believe the opportunity is restricted to members of the studio orchestra but I'm not certain. At least the school board acknowledged that she did; I can't find news or a press release. There was a later board meeting that reported Doris was honored with the president's award in Las Vegas. Mast Way and Moharimet food service won awards as well. Mast Way Elementary School’s Cafe Manager Lori Buckley was recognized as the Manager of the Year by the School Nutrition Association of New Hampshire. Congratulations Doris and everyone associated with our award winning food service. The summer free lunch program goes on for the duration of Summer REACH, one more week I think. Kids eat free, adults have to pay. The agreement between the district and outside organizations using school facilities has been revised. The changes are the result of a lawsuit where the district is being sued because one of the organizations using our facility did not comply with the ADA at a level the school would because they apparently aren't required to. The revised use agreement changes that, at least when they use our facilities. It also places increased insurance requirements on organizations. The Middle School has been leading the district's efforts toward competency-based reporting, with competencies replacing the usual letter grades. Each subject is divided into four to eight broad competencies, which are discrete units to be learned. (These may be subdivided.) For several years, and nearly schoolwide last year, ORMS has been using a three level system for grading each competency: Beginning, Progressing and Meets. This coming year they are adding Exemplary, presumably because mommy and daddy are complaining that their little genius is more than merely competent. This idea met resistance before because it was difficult to define what exactly exemplary competency means. It's not even grammatically similar to the other ones. Maybe they'll just know it when they see it. I guess we'll find out. The ORHS results of the 2017 YRBS are in, which always makes for some scary reading. Again I can't seem to find a link other than a discussion in a school board meeting. I'll just screenshot some slides; click to enlarge. Believe it or not, we got another nor'easter on Election Day. Towns of Durham and Lee both say the polls are open, starting now, 7am! No word from Madbury yet, which is scheduled to open its polls at 11 am. This is my annual guide to the 2018 Oyster River School District election. I call it a biased guide because in addition to (I hope fairly) explaining each warrant article, I tell you how I'm going to vote, which is the biased part. It's a pretty uneventful school election this year, so I'll go over some news from the Deliberative Session first. I was literally at sea but I remembered to tune into the Deliberative Session (video) around a half hour after it started. I was just in time to hear a motion to adjourn. This seemed to be the shortest ORCSD Deliberative Session that anyone can recall. The Session went smoothly. There was exactly zero discussion by the public on any of the warrant articles. All will appear unchanged on Tuesday's ballot. The meeting started with this year's Oyster River Distinguished Service Award being given to Brian Turnbull. Anybody who attends concerts at the schools often sees Brian up there playing upright bass and setting up and taking down chairs. He was the main force behind getting a dedicated strings program at Oyster River, and he's been helping it along ever since, most recently by forming a booster organization for fundraising. Congratulations, Brian. I thought the most interesting thing at the meeting was Member Howland's discussion of the addition to Mast Way. For the first time I can remember, the Mast Way enrollment has exceeded Moharimet's. Just a few years ago Moharimet was terribly overcrowded. The district reacted several ways: by adding dedicated cafeteria space to the Multipurpose Room, and by moving the dividing line between schools to shift students to Mast Way, which seems to have worked, perhaps too well. The addition consists of four classrooms including a music room at the rear near the baseball field. The budget on Tuesday's ballot includes $340 K for this work There will also be work on the front entrance using a $500,000 state grant that's the result of a Homeland Security audit. Congratulations to existing school board members Brian Cisneros, Al Howland and Dan Klein. They are the current town-specific representatives from Lee, Durham and Madbury respectively. As the only candidates for their respective seats, each is exceedingly likely to be elected to a new three year term on Tuesday. It will be reelection for Al and Dan, and a first time election for Brian, who was appointed when Maria Barth resigned last year. February13th Candidates Night had an usually large turnout, around fifteen members of the public. Usually it's just the candidates, the clerk, a cameraperson, a PTO parent with refreshments and me. This year no one recorded the meeting, in contrast to last year when there was a crew of four but no video ever appeared. So this year we've achieved the same result with much less effort. I stuck my head in for the beginning and the end. The discussion seemed to be centered on cell phone policy, which is up for review. The candidates Brian, Al and Dan kept saying they probably wouldn't get it right the first time. They needn't have been so wishy-washy. The policy was changed a year or two ago and is back in play due to complaints so we're certain they didn't get it right the first time. I missed Candidates Night because I was at the Strategic Planning Forum. It was run by a couple of folks from NESDEC, the New England School Development Council. I think these same folks ran it five years ago, and that meeting produced an awesome history of the district. The meeting was pretty much a waste of time. Each small group sat around the table making lists of strengths and weaknesses of the district. At the end each of us listed our top five priorities on an oddly confusing bingo card provided by NESDEC. Superintendent Morse missed the meeting because he was in Nashville being honored as NH Superintendent of the Year. Election day in Oyster River is this Tuesday, March 13th. Hopefully unlike last year there will be no weather incidents that lead to the towns voting on different days. [I can hope but I'd be wrong. Nonetheless polls are open in Lee and Durham (and probably in Madbury at 11 but no official confirmation yet).] If you're a US citizen over 18 who lives in Lee, Madbury or Durham, you can just show up on Tuesday at your town's polling place and vote. Like almost all elections in New Hampshire, same day registration is available. So even if you've never voted or registered to vote in New Hampshire before, you can vote Tuesday. It's easier if everyone brings a state photo ID and if new registrants also bring proof of address (a utility bill), but under New Hampshire's voter ID law you can vote even if you don't bring those. As always, voters in each town are given identical school district ballots. Let's speed through the ballot questions, also known as the warrant articles. Article 2 elects the school board members. This year we have three candidates for the three town-specific seats, so they're all going to win. They happen to be existing board members Brian Cisneros, Al Howland and Dan Klein, so no changes there. I don't think the teachers' guild even bothered with their usual questionnaire this year. I haven't seen a single campaign sign. I probably still have ones for Al and Dan I should dig out. Article 3 asks the district to approve the agreement with the Bus Drivers. The bus drivers got unionized this year, so negotiations took a long time and the drivers are getting substantial raises. The salaries weren't too much of a sticking point during negotiations. The district wanted to raise driver pay because of the current difficulty hiring and retaining drivers. The numbers are the total increase in salary and benefits to be divided among all drivers each year. I'm voting YES. Article 4 ask the district to approve the agreement with ORPaSS, the paraprofessional and support staff bargaining unit. These folks have been on a bit of a roller coaster, taking small raises six years ago in the wake of the Great Recession, then getting large raises three years ago. This is return to a more typical raise. I'm voting YES. Article 5 is the main budget. Over the last few years the state has reworded this boilerplate to make more sense. We see the default budget is only $70,000 less than the full $45.6M budget. That means if NO wins (and there's no subsequent vote) and we get the default budget, the taxpayers save 0.15%, fifteen dollars off a ten thousand dollar tax bill, essentially no difference. The district budget goal was to stay within a 3.25% tax impact, which they did. Unfortunately the impact is unevenly distributed throughout the towns. 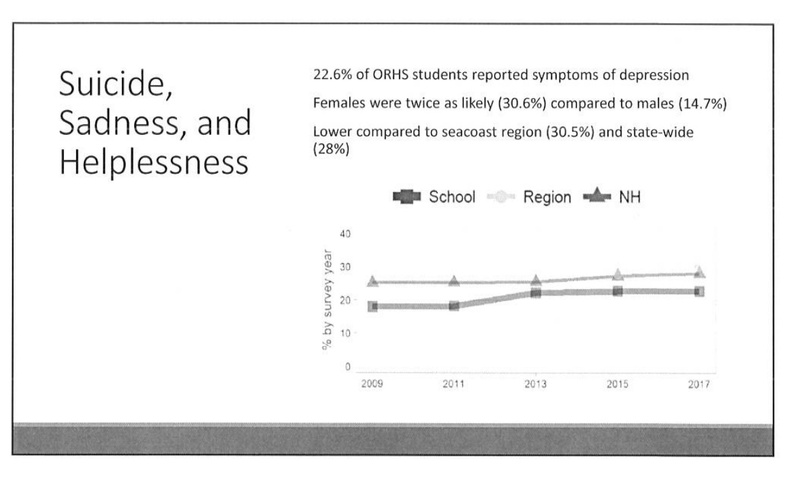 Member Howland included this slide in his presentation at Deliberative Session. What jumps out is Madbury's millage increasing substantially more than the other towns. 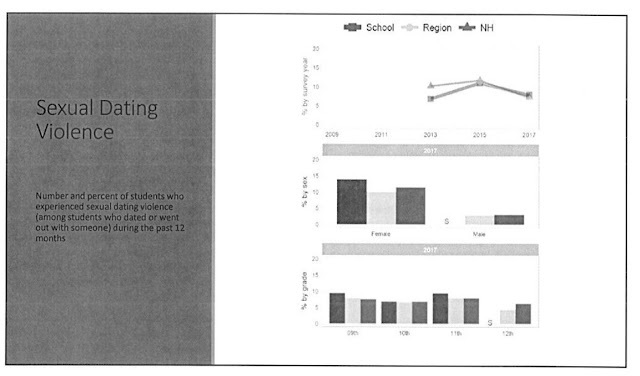 Madbury is losing students, so should be expected to pay less of the share of district costs. (The apportionment formula splits the bill in two, and bills the towns half in proportion to property values, half in proportion to number of students.) Member Howland attempted to explain this as some difference in timing as to when the state calculates its aid to towns versus when we sample the numbers for apportionment purposes. I think that means we should see the opposite next year. It wasn't particularly clear so I hope to look into it more. In the meantime, I'm happy to live in Lee. I'm voting YES. See everybody at the polls. I haven't posted in a while so I thought I'd recap some district news first. Please skip down if you just want to know about the Deliberative Session on Tuesday night. The biggest news is the board approved a cooperative football agreement so Oyster River students may play at Portsmouth High. It's been widely reported (Foster's) so you probably don't need me to tell you. It's expected that around 15 to 20 students from Oyster River will play football on the Portsmouth team. If NHIAA approval can be expedited Oyster River kids will start playing in the fall of 2018; otherwise they'll have to wait until fall 2019. The agreement must be renewed every two years to continue. The problems with the unadopted 2016 coop agreement with Portsmouth have all been addressed. Previously the NHIAA wanted districts to intend to have a team at the school when the coop ended, which was a sticking point for the Oyster River board, especially with Portsmouth's stated desired to end the coop after only two years. This time Portsmouth assures us they're with Oyster River for the long haul and the NHIAA no longer weighs if a district intends to continue after the coop. Title IX was another major concern, with a nominal need to fill a slot with a girl athlete every time a new slot is filled by a boy. Our lawyer has assured us the expected imbalance will not be a problem. Furthermore there will be no cost to the district, the players provide their own transportation, the additional liability is minimal, and both schools have moved to later start times. This is I think the fourth time the district has addressed the football issue since 2013. It's been a divisive issue in the community and I'm glad a satisfactory compromise was reached. I was at all the school board meetings where this was discussed and I went to the forum in the auditorium on 1/10. The best thing about the process was watching the kids talk at the podium. It's pretty scary up there the first time and they were all incredibly impressive. You could tell the board really wanted to find a way to give them what they wanted. The worst thing was the adults. Just a few of them. Some people who wanted their kids to play football publicly accused the board members of all sorts of bad faith. A few scared member Rotner, a likely NO vote, to the point where he felt he had to recuse himself from the issue for his own safety. It's really, really unacceptable to treat our public servants like that. I thought some people made inappropriate comments at the football forum; fortunately for them I don't see any video posted. It's clear on this issue the board has consistently acted in the students' and community's best interest, rejecting the flawed proposals and accepting this better one. So you know who you are. When you see a board member, the words you're looking for are "thank you" and "I'm sorry." Congratulations to Superintendent Morse, chosen as 2018 New Hampshire Superintendent of the Year by the New Hampshire School Administrators Association in conjunction with the American Association of School Administrators. We all knew he was pretty great these past five years but it's nice to get official recognition. There was a party in Dr. Morse's honor at the high school last week. Thanks to Food Service Director Demers for the great food, including cake. NH Education Commissioner Edelblut spoke first, followed by Chairman Newkirk, Assistant Superintendent Allen, two leaders of the teachers guild (someone help me with the names, please) and Dr. Morse himself. Dr. Morse's daughter and grandson attended as well as around 75 community members, including me. As usual, Dr. Morse gave the credit to others, but we're all thrilled he's getting the recognition he so richly deserves. Last December the board approved a $3.7 million capital plan with Siemens. Under the deal Siemens will do capital improvements at the schools over the next year or two, mostly focusing on energy efficiency. The district will pay them a fixed amount annually, I believe over ten years, for the work. If this sounds like a bond, it is in all but name. NH Law requires 60% voter approval for a bond. It took us twenty years and five election days to get the approval to borrow $1.7M to build the track. But it took the board just a few minutes to borrow $3.7M for this project. It encumbers future boards for the next decade without any approval from the voters. I don't like this end run around the voters, but it seems how municipal finance is done in New Hampshire these days. We should have gotten Siemens to build the track and avoided all that hassle with the citizenry. Tuesday 2/6/18 is the Oyster River Cooperative School District Deliberative Session. As usual, it's 7pm in the ORHS auditorium. It's a real election where hardly anyone shows up, usually between 100 and 120 voters. So you and your majority of 60 can rewrite the budget. Or stop it from being rewritten. Last year the football question got mangled at Deliberative Session which complicated the discussion this year. I'm out of town again this year so I won't be there. A majority of voters at the Deliberative Session can amend the existing warrant articles (also known as the ballot questions). You must be eligible to vote in one of the three towns to be given a voting card at the DS. Sometimes there's been same-day registration at the DS. So if you can legally vote in any of the three towns (i.e. you're a US citizen at least 18 who lives in the district) you can show up at the DS, (maybe) register if needed, and vote. It's best to show ID (and proof of address like a utility bill if you need to register), but if you're willing to sign an affidavit you don't have to. The voters at the DS get to amend each warrant article, but the articles themselves aren't approved or rejected until election day, Tuesday March 13, 2018. Usually we get two or three thousand March voters. I couldn't find the official post of the warrant. I got this copy from recent minutes. This year only the big budget article, article 5, can be modified at Deliberative Session, so I don't think it's going to be very exciting. The ballot starts like this every year. These articles are skipped at the Deliberative Session. Article 3 asks the district to approve the agreement with the Bus Drivers. The bus drivers got unionized this year, and they're getting substantial raises. The salaries weren't too much of a sticking point during negotiations. The district wanted to raise driver pay because of the current difficulty hiring and retaining drivers. The numbers are the total increase in salary and benefits to be divided among all drivers each year. These negotiated agreements cannot be modified at Deliberative Session, so ideally this article gets moved and approved without discussion. Article 4 ask the district to approve the agreement with ORPaSS, the paraprofessional and support staff bargaining unit. (I don't think they're officially unionized, but there's a standard three year cycle for negotiating contracts.) Again, there's nothing to do at Deliberative Session for negotiated agreements. Article 5 is the main budget. It's really the only article that can be amended at this Deliberative Session. I don't see any particularly good reason to do so, but if something is going to happen at DS this year, it will be to article 5. Over the last few years the state has reworded this boilerplate to make more sense. We see the default budget is only $70,000 less than the full $45.6M budget. That means if NO wins (and there's no subsequent vote) and we get the default budget, the taxpayers save 0.15%, fifteen dollars off a ten thousand dollar tax bill. Of course the voters at DS are free to cut the budget to below the default budget if they like, but the closeness of the two is an indication of how tight a lid the board has kept on spending. That's it. Short guide this year. Even though I won't be there, I encourage all of you to go to ORHS auditorium at Tuesday, Feb 6, 2018, 7 pm. The articles are taken one at a time. An assigned board member reads the article, then says "I move article X". Other board members second. The assigned member continues the presentation for a few minutes. Then the moderator opens up the floor. At this point, voters lined up at the podium get to propose amendments. They can also ask clarifying questions, and actually get an answer from the board or administration. Sometimes the voters don't get the idea that they're there to amend the ballot. I suggest if you go up to the podium to make a speech, include either "I propose we amend the article by changing the amount to $XXXX" or "I support/oppose the amendment under consideration." If there's no amendment under consideration and you don't want to propose one, save your speech and let's get on to the next article. Lots of people feel compelled to speak for or against the article. The deliberative session is a good place to air the debate, but it's better if there's something you don't like about the article that you propose to amend. If the speeches drag on, you can move to "call the question." This means ending the debate and voting on the amendment (or if there's no amendment, voting to put this article on the ballot as is and move on to the next article). If there's a second, the moderator will ask people who are for calling the question to show their cards, and then against, and eyeball it. A 2/3 supermajority is required to call the question. If it's close it can take a long time to count those cards. At that point you should say "I withdraw my motion" because it's going to be quicker and more interesting to let the speeches continue than a tedious count on this 2/3. Once an amendment under consideration is about to be voted on, you can request a secret ballot. You need to give the moderator a written request with the signatures of five voters. If you request a secret ballot before there's an amendment under consideration, you're going to look silly. If you request one while people are still lined up to speak, the moderator will ask if you're calling the question, and if you say yes we get into all that 2/3 nonsense. By the way, if you wanted to get your own article on the ballot, all it requires is the signature of 25 district voters. The deadline is usually early January, too late for this ballot.